The Varnished Culture continued to mix incognito with the great and the good of the criminal law, at the 15th International Criminal Law Congress in Adelaide, October 2016. Here’s the retort of a layman to some of the contentions aired during this stimulating, engrossing and profound conference. Global Crime got in-depth treatment today, when we heard from Felicity Gerry QC on Human Trafficking and Criminal Justice, Alex Ward on the disparate criminal approaches among the Commonwealth nations, and William Smith on International Courts and Tribunals. These speeches were really interesting and very depressing on a myriad levels. One only has to hear from Gerry on bonded or sexual slavery, Ward on child brides and genital mutilation, or Smith as to ethnic cleansing, to be reminded that the Human Erect Rat hasn’t yet evolved from the status of ignoble savage, and probably never will. No country is immune to a charge of barbarity, of course; we all have a metaphorical cross to bear, though we note the U.S. State Department, showing gorgeous gall, produces a regular ‘report card’ on civil rights abuses by all countries, except its own! The international framework for bringing crimes against humanity to justice is a hotchpotch of ad hoc tribunals and investigative groups, with a substantial number of nations immune from purview as a result of non-ratification of U.N. treaties or protection by patron states enjoying Security Council veto. For example, America, China and Russia have veto as well as refusing to ratify membership of the International Criminal Court, rendering their respective views on the moral worth of other nations fairly inconsequential. We’re a long way from global governance, perhaps fortunately, given the extravagances of the U.N.
One would imagine that Australia is well down the League Tables of Comparative Atrocity. Thus when global humanitarians suggest, as occurred at this Congress, that “Australia is becoming inextricably linked to ‘torture'” and it is insinuated that we are close to attaining world-leadership in this odious area, coupled with theses emanating from Leiden University on “How to Prosecute Australian Prime Ministers for War Crimes”, we fear a retrograde tendency, somewhat of an overreach, dare we say?. Dry thine eyes and go back two steps, Bono. Adolf Eichmann, inevitably, got a mention. It is strange how this colourless fellow (who manipulated an entire diaspora and then tried to avoid culpability for its horrific outcome) has loomed so large in the rogue’s gallery of the Third Reich, given the greater and even more repulsive characters available. 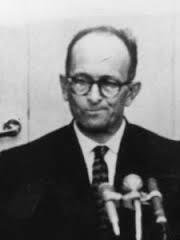 Whilst it can be salutary to recall Eichmann and his cluster-scum, let us not, as Hannah Arendt impliedly warned against, use him to try “to escape from the pressure of very present and actual problems into a cheap sentimentality.” Although Arendt and her idol Martin Heidegger were rather too robust about the Nazis and far too contemptuous of their victims, her observation has at least utility for the global guardians of humanity now – after all, we were soberly informed at the Congress that between 1948 and 2008 there have been 313 armed conflicts upon the globe, some of them very messy indeed. So has the human race learnt anything?